After visiting the U.S. and Europe in 1966 on a peace mission, he was banned from returning to Vietnam in 1966. On subsequent travels to the U.S., he made the case for peace to federal and Pentagon officials including Robert McNamara. He may have changed the course of U.S. history when he persuaded Martin Luther King, Jr. to oppose the Vietnam War publicly, and so helped to galvanize the peace movement. The following year, King nominated him for the Nobel Peace Prize. 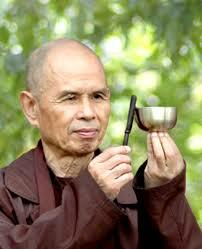 Subsequently, Nhat Hanh led the Buddhist delegation to the Paris Peace Talks.